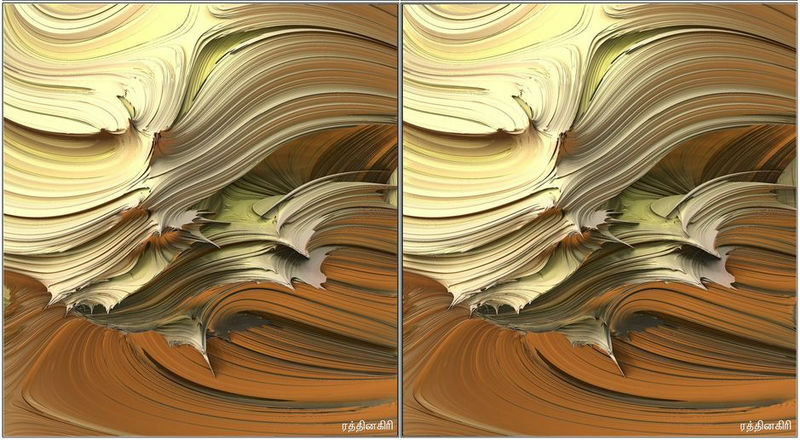 Although it’s probably been a perennial theme in fractal art from the beginning, the recent 3D fractal explosion has greatly increased the number of images whose main impression is that of The Strange Place. Because of this, I think it’s only appropriate to examine more closely this reinvigorated sub-genre of fractal art. Fractal art? Actually, Strange Places often feature what could be called foreign objects and elements, producing what in traditional art circles is vaguely referred to as Mixed Media. Erisian’s image above, which the author says was made with Bryce and Tiera-Zon is a good example of this. Bryce is a well established 3D graphics program that gave birth to the computer graphics “artform” of fairy tale landscapes encased in shiny glass balls, floating on beautiful oceans at sunset. Erisian’s parched landscape and departure from “glass-ball-ism” is a refreshing thing to see associated with Bryce. The use of Tiera-Zon, a classic 2D fractal program by Stephen Ferguson, on the other hand, was a genuine surprise to me. I thought it had to be something made in one of the Mandelbox programs. But no, Tierazon has entered the 3D universe (via Bryce, I assume). 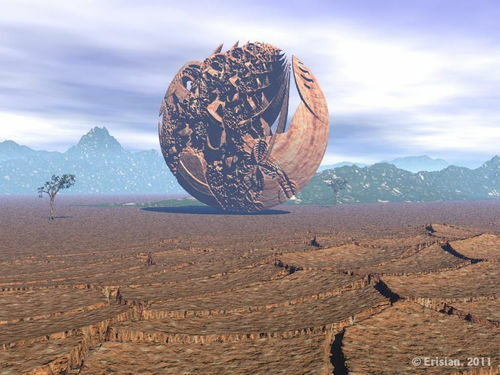 This one here by MarkJayBee (on Fractalforums.com) is pretty old by mandelbox standards, dated at May 4, 2010 (seems like a decade ago). 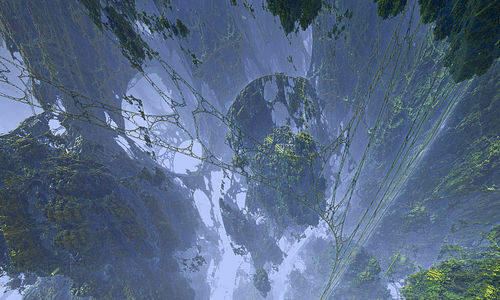 Mark specializes in sci-fi mandelbox panoramas so it’s not surprising he’s captured what I would call a Strange Place. What could be a better use of Strange Places than sci-fi environments? It looks just like a scene out of the movie, Avatar, with its floating pinacles and dangling vines. What makes for a Strange Place is such an alien panorama as this: realistic, and yet unreal. You feel like you’ve been someplace. A Strange Place. Did I say MarkJayBee’s mandelbox was old? 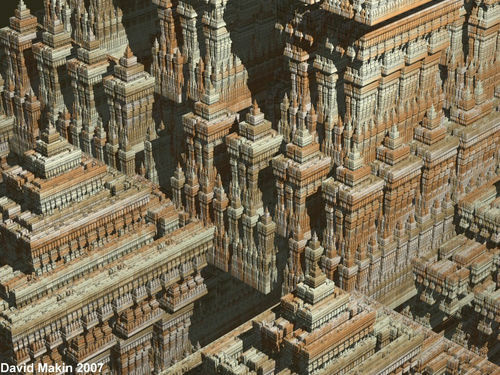 This Sierpinski Temple by Dave Makin actually predates the 3D Mandelbulb/Mandelbox arrival. Of course, you can see that in Dave’s conveniently located watermark in the bottom left corner. Someday, perhaps, the only digital artists that will ever be remembered are those who wrote their names on their work. This is a real sci-fi city Dave has created. Richly detailed, majestically lit, it’s a city of Empire State buildings, each one half statue and half office building. Actually, they’re nicer than the Empire State building. And here we are, perched like eagles, looking into these crowded canyons of sacred architecture. That counts as a Strange Place. 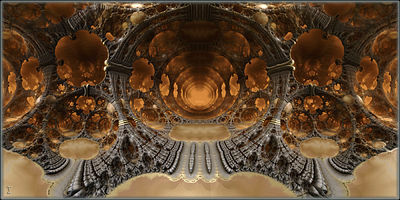 Janetino (Deviant Art ID) creates some of the most vivid mandelbox renderings I’ve ever seen. If this was a high resolution, professionally taken photograph of the real thing it wouldn’t look as good as this. Most of the time perfect renderings like this look plastic-y and lifeless but not here. These are heavily ornamented metal doors leading to some of the greatest rooms in the king’s palace. Or are they the lavishly crafted doors of the king’s treasure vault? This is as close as we’ll get, but we’ve been there. We’ve been to this Strange Place. Here’s a slightly different one but nonetheless characterized by the quality of an alien view, The Strange Place. The Rev really shows some style here in this one: nice composition, coloring and that special something that you just can’t describe but can see so well –style. This looks very mandelbulbish; I see those round fuzzy things on the walls. It’s always a minor triumph to make something this appealing from that old pollen spore, the mandelbulb. We’re crouched in a cave and looking out onto the golden rockwalls of the Valley of the Kings in Egypt or maybe one of the many niches and cavities surrounding Qumran where the Dead Sea Scrolls were found. Ancient and alive forever looking into the Sun. Or is that just me? I’m a million words rolled up on papyrus and a I don’t ever want to be found. The world is not worthy of my secrets. This is a fine Strange Place if there ever was one. I’m going to hang out here for a while; you can head off to YouTube if you like. Are they hoops, tunnels, giant wicker honeycombs? There’s a Victorian, Steampunk look to it; wrought iron or Eiffel Tower-esque? And I keep thinking what a cool racecourse this would be for the video game, MX Unleashed or Off-Road Fury because there’s something in this that says roadway. How’s that for a Strange Place? Driving is believing. Strange Place is type of artwork that expresses wonder and mystery via a language of physical environment –scenery. You could say it’s the computer version of landscape art, but that’s putting it mildly. There’s commonly a surreal tone to Strange Places because computer algorithms, like fractal formulas, don’t create wall calendar nature scenes, they make freaky stuff. In fact, the parameters that render a Strange Place image might just as easily render something entirely different with a few minor adjustments. That’s the magic of fractal algorithms: you don’t know what’s around the corner until you go there. Strange Places are vacation snapshots of digital places. They’re as real as any other place you can take of photograph of, and now with the current 3D fractal developments including actual stereo video rendering (3D glasses), they’re almost as real as it gets without actually being in the picture. Rathinagiri’s cross-eyed stereograms that I posted about before, show how vivid the digital world can be. The digital world is the Strange Place I’m talking about, I guess. 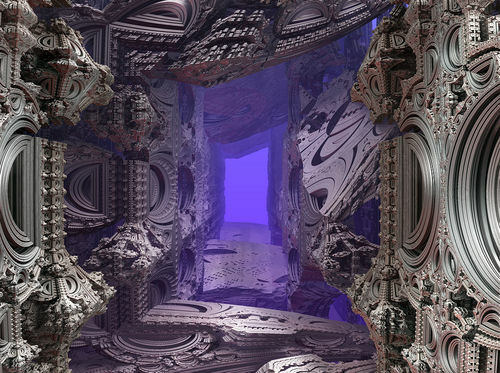 3D stereo fractal imagery just might be the ultimate level to the art of the Strange Place. When I look at Rathinagiri’s image in cross-eyed mode, it’s like these swirly clay shapes are right in front of me and I could reach out and touch them. I’m practically in the picture, the illusion is so strong. Rathinagiri hasn’t just given us an image of something to look at, he’s given us the real object itself. You just can’t touch it; no different than being in real world museum or art gallery. I’ll bet it’s that intense reality that motivates him to keep creating stereograms. 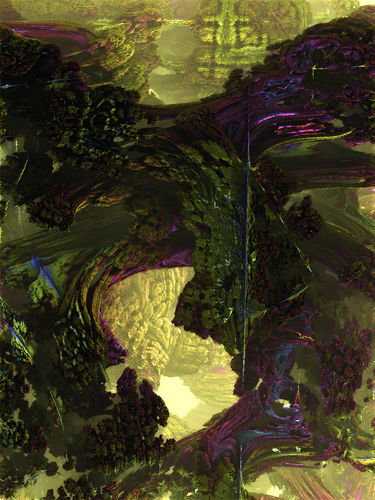 Anyhow, that’s the art of the Strange Place and I think it’s a sub-genre that will only grow and develop the way things seem to be going in fractal art these days. So if you find there’s something powerful and compelling about a fractal image but you just can’t fit it into the regular categories of visual art or find the words to explain what’s so good about it, it’s probably this Strange Place thing I’ve been talking about here. A fresh wind of surrealism. For the true eye-ball enthusiast.